Fully Automatic World Class Disco Wafer Dicing systems handle wafers ranging from fragments to 300mm diameter. Wafer cleanliness is maintained with surfactant injected into the DI water system and ESD is eliminated with CO2 bubblers and anti-static ionized work stations. Our experienced operators can take your multiple die type wafers with complex dicing patterns and save all dice or sacrifice some to retrieve the most important. At Integra Technologies, no two customer products are alike and each product wafer will be diced with specially customized program parameters to minimize yield loss. Our narrowest cut line can be as low as 15µm. Integra's engineering research has isolated 40 root causes of die chipping, which causes low die strength and poor yields. Integra's ability to dice with parameters optimized to each individual customer's device has led to Integra's success and technical leadership in the industry for chip-free, high-volume wafer dicing. Integra has developed proprietary techniques to allow for the safe singulation of IC devices from a wafer that has been ground very thin (as thin as 25 microns). The DBG process is principally used for singulating IC die when normal sawing would create unacceptable levels of chipping and edge damage. 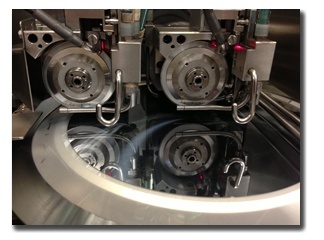 Integra is one of the first companies to adopt Die Attach Film (DAF) in its wafer/die singulation process. This allows dice to be die-attached directly onto the leadframe or substrate without epoxy adhesive dispense. Integra also has a die chipping monitor which can be implemented to monitor yield on a real time basis. These and many other processes are available to reduce manufacturing cost and yield loss for customers. Materials processed at Integra include Silicon, GaAs, Sapphire, Quartz, SiGE, Laminates, Piezoelectric, Glass, and other materials.